Phong Nha– Ke Bang national park is known as one of the most attractive destinations in Vietnam. Every year, a lot of people come here to visit and explore its caves as well as its flora and fauna. However, not all of them know tips to have a good trip to travel to Phong Nha. How to have a nice trip and how to make your time in Phong Nha interesting? Let read some following tips and make your trip become more meaningful. Phong Nha – Ke Bang international park is located in Bo Trach district, about 50 km to the northwest of Dong Hoi city. Every vehicle you choose will only take you to the center of Dong Hoi city. From Dong Hoi to go to Phong Nha, you can catch a taxi, bus, rent cars, motorcycles. Go to Phong Nha, you can stay at Phong Nha Farmstay, Cu Nam Village in Bo Trach, ( +84944759864). Australian owned Resort style. Two night minimum requirement. The price is about 35-70USD. There are also many different low price hotels near Nhat Le beach such as Sai Gon Phong Nha hotel, Dieu Linh, Luxe, Nam Long, Sunrise, Muong Thanh Quang Binh,… The price is from 450.000 dong. From these hotels, you can see Nhat Le beach. These hotels are also near Phong Nha cave, so it’s more easy for you to get to Phong Nha. Phong Nha cave is the most famous cave in Phong Nha-Ke Bang national Park. It should be the first choice to visit when you come to this national park. This cave is about 45 km from Dong Hoi. It takes you about 45 mins to travel to phong nha by bus and 1 hour to travel by motorbike. This cave is a wet cave and famous for rock formation which has been given the name such as the ” Lion”, the ” Fairy cave”, “the royal court”, and the ” Buddha”. To get to Phong Nha cave, you have to take a motor boat drive through beauty scenic along the Son river. It’s really interesting, but the tickets boat transportation price is quite high. After 25 minutes on boat, you will arrive Phong Nha cave. The best time to visit Phong Nha cave is from January to October. In November and December, Phong Nha Cave is often closed because of seasonal floods. After visiting Phong Nha cave, tourists often visit the Tien Son dry cave. 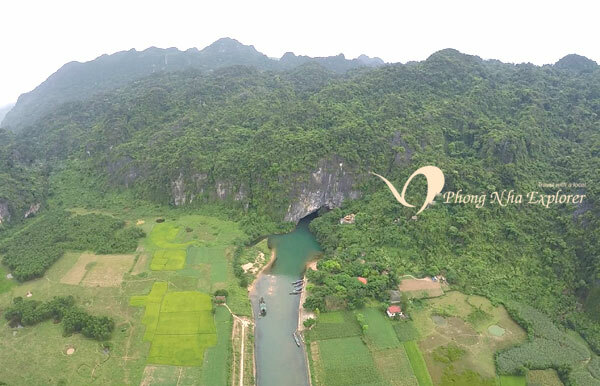 Phong Nha – Tien Son can be called a twin of the Creator. Phong Nha – Tien Son is a unified body. Located at an altitude of about 200m above the ceiling of Phong Nha cave, Tien Son cave is 980m in length. Discovering this cave is really interesting. – Phong Nha: 150,000 VND / person / trip. – Tien Son: 80,000 VND / person / trip. – Children over 6 years: 20,000 VND / turn. – The Boat 1: 320,000 VND / Boat / Hit. – The Boat 2: 350,000 VND / Boat / Hit. Note: Each boat carrying only a maximum of 14 people and a minimum of 1 person. If you travel in a group, you should hire a private boat. If you travel alone or with 1 or 2 friends, let share the boat with others to reduce the price. Paradise cave is about 70km from Dong Hoi. It’s a dry cave and is called “underground palace” . This cave is 31 km long, longer than Phong Nha Cave. It is one of the most magnificent and magical wonders in the world. Chay River – Dark Cave is about 50km north-west of Dong Hoi. Chay River, romantic river between Phong Nha Cave and the Dark cave. It is one of the most beautiful rivers in Quang Binh with hundreds of natural Bonsai on the river banks. Quang Binh is known not only for its many beautiful beaches, scenic captivates but also for its special dishes. Go to Phong Nha, tourists have chance to enjoy a variety of dishes such as Chao Canh, Bot loc cake,… They are really delicous and unforgetable. Chao canh is a special food in Phong Nha. Don’t forget this dish when you come to Phong Nha. Go to phong nha, You can visit the restaurants near Nhat Le beach to feel and enjoy many exciting sea foods. These are only some information and tips which help you know more about Phong Nha. Hope that with these tips you can organize your trip to Phong Nha more easily and have a good time there.